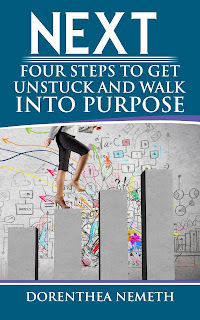 Get Ready to Get Unstuck and Walk into Purpose! Ever feel like there’s more that God has for you? Do you have dreams, but you sometimes feel like they will never come to pass? It’s time to stop wishing, and start POSSESSING! You’re never too old, too young, or too poor to walk in your divine purpose. Get ready to be shifted from a place of complacency and mediocrity. Get Ready for Your NEXT! Dorenthea is an author, speaker, and worship leader. She knows that she’s called for one purpose, and that’s to give the devil a black eye with her worship and with her words of faith and inspiration, letting people know that, no matter what, quitting is NOT an option.